When Donald Trump’s Apprentice first screened on Nine it was great fun. The Trump was larger than life, had a great “you’re fired” catchphrase, and it was a pretty slick format. Coming from Mark ‘Mr. Reality’ Burnett that’s no surprise. It’s a shame that Nine didn’t persist with it for very long. Its ratings petered out, but ironically, they weren’t hot for Hell’s Kitchen or Two and a Half Men either. The UK counterpart to The Apprentice is a dead ringer for the American prototype. It sticks like glue to the format of hungry entrepreneurs, a glamorous home, a gruff CEO, his silent executive sidekicks and crazy challenges. I sat down to watch ten minutes of this preview, but stayed right to the end. Sugar, who rose from a working class upbringing to billionaire is such good camera talent it was hard not to enjoy what remains a tight format. In the first episode the teams are forced to buy wholesale fruit and vegetables, sell them at a market and return with more profit than their opposition. The girls resort to feminine charms, the alpha-males team is close to imploding. There are also plenty of ambitious contestants, which is a key factor to the show’s success. Watching them negotiate their inner hierarchy while they seek to make their mark is half the fun. But it’s Sugar himself who is the find here. He’s outspoken, easily irritable, and barks like a British bulldog. You’d swear he was split from the same atom as Bob Hoskins. If you enjoyed the US series, you’ll love this one too. 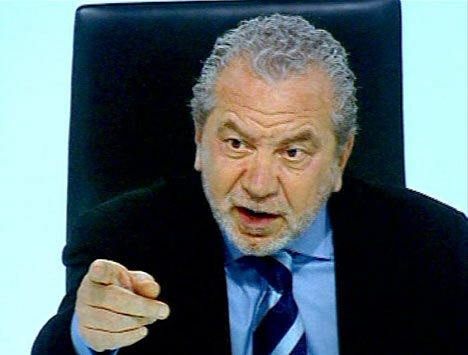 Alan Sugar: The Apprentice premieres 9:30pm Wednesday August 27 on Seven.